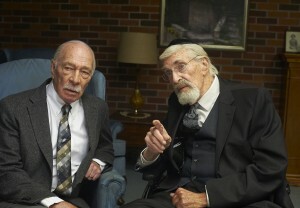 (l-r) Christopher Plummer and Martin Landau star in REMEMBER. ©A24 Films. HOLLYWOOD—Actors frequently lament the challenge of finding juicy roles that they can sink their teeth into. That elusive desirable role is only compounded as they age. And yet Landau, who has worked with the likes of Alfred Hitchcock, Joseph L. Mankiewicz and Woody Allen, was mentored by acting guru Lee Strasberg and coached up-and-coming stars like Jack Nicholson and Angelica Huston, continues to ferret out those desirable gigs that challenge him and entertain audiences. 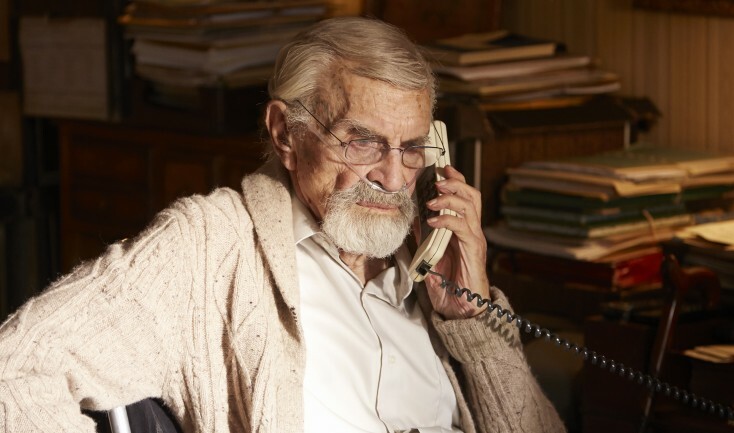 In a decidedly non-grunter role, Landau, 87, stars in Atom Egoyan’s “Remember,” alongside fellow seasoned thespian Christopher Plummer. They play residents of an assisted living facility who devise a plan to track down and exact justice against a vicious Nazi concentration camp guard who is discovered to be living in the U.S. under an assumed identity. Landau plays Max, the mastermind of the mission. Confined to a wheelchair, he convinces the perambulatory Zev (Plummer), a recent widower, to fulfill a promise he made years earlier to find the man responsible for so many countless deaths, including those of their family members, and kill him. The thriller, written by first-time screenwriter Benjamin August, is an intimate story, set in the present, but triggered by events that took place 70 years earlier. “Remember” opens Friday, March 11 in New York and in Los Angeles March 18. Landau’s Max guides Zev step-by-step through their secret plan, which they haven’t even disclosed to their children, to track down a man named Rudy Kurlander, even though Zev suffers from dementia and must frequently refer to written instructions from Max, as he makes his journey across the country. The film also stars “Breaking Bad’s” Dean Norris as well as Bruno Ganz, Jurgen Prochnow and Heinz Lieven, who all play characters named Rudy Kurlander. Landau previously worked with Egoyan nearly three decades ago on an episode of “Alfred Hitchcock Presents,” when the Canadian filmmaker was in his 20s. “Over the years, we’ve wanted to work together again … and it’s finally happened,” says Landau, looking professorial in a brown jacket, blue shirt and tie and scarf, topped with a newsboy style cap. In addition to his Oscar-winning role in which he depicted fading movie actor Bela Lugosi in “Ed Wood,” Landau has a portrayed a number of real life individuals, including famed Nazi hunter Simon Wiesenthal in the 1990 TV movie “Max and Helen,” as well as memorable fictional characters on the stage and screen. Q: What drew you to this script? So when I read this and Atom (Egoyan, the director) called me and sent me a script and this guy (Max) had worked for Simon Wiesenthal, I figured I probably was one of the few Americans that ever spent time with him. When my character says he worked for Wiesenthal and he is physically unable to (track down Nazis) any longer, so many things in the script related back to me in certain instances. I mean, I’m not going to play Fred Astaire. But it resonated, and I kept thinking about this script and the ending. It’s a surprise ending, which I did not see coming. When Atom sent this (script) to me, it reverberated. I put it down, but it stayed with me. There was no doubt in my mind that I was going to do it. It hung in my head too long. It was disturbing because it was different than almost anything else I’ve read. I’ve played characters with Alzheimer’s. You know, when you get old you play lots of different types of old guys. Anyway, I loved the writing. I loved the idea of working with him again after 28 years. So it was a no-brainer. Q: What do you like about working with Atom Egoyan? Landau: I have to pay him a major compliment because a director gets to know actors and spend time with them and that helps the movie. He had actors coming in like Heinz Lieven, who came in from Germany for one day (of shooting). He’d never been to Canada before. He’s never been on this side of the ocean before. He’s a big theater and movie actor there. By the time he got to know him, he was gone. The difficulty he had was he’s not getting a chance to know these actors and yet he’s directing this movie. So I think he did an amazing job because he didn’t have the ability to modulate the performances the way he would ordinarily. I’ve worked with him and he’s really a terrific director. He knows content. To create the balance he had to do that in the editing room, and I was shocked and wonderfully impressed when I saw the movie. Q: Had your path crossed with Christopher Plummer previously? Q: Could you talk about getting into the character of Max? Landau: My character is present. He’s patient even when he’s impatient. I always say three-quarters of what an actor chooses to do is not seen by anybody but himself. It makes him present. You don’t have to see all the stuff. It’s not important as long as the person belongs in that room, in that place, in that moment. That’s what an actor has to strive for. It’s not necessarily noticed by most critics, but it’s okay. When you see an actor that isn’t tentative, you’re comfortable. Also, most people don’t know what they’re doing half the time. I like to see doubt and confusion and discern it in a performance. A lot of “Method” actors, which I am one of, play something like a locomotive. They’re (all about) action, intention, and reason for being. You see a lot of this on television. They’re so certain about everything. But most people don’t know what to do half the time, and I love to see that in a performance. Q: How did you prepare for the role of this guy who is confined to a wheelchair? Landau: I looked forward to it. (He chuckles.) I mean I’m 87 years old. In two and a half years I’m going to be 90. I keep quoting (Paramount Studios founder) Adolph Zukor, who once said at his birthday party, “If I knew I was going to live this long, I would’ve taken better care of myself.” And then he sat down. Q: One of the interesting issues in terms of your character is that he always seems to have done things the right way in the past. Working with Simon Wiesenthal, he pursued justice on behalf of the victims of the Holocaust through the judicial process. And now at the end of his life, why does he choose to administer vigilante justice? Landau: My character is the only person who knows the end of the movie at the beginning of the movie. If you watch it a second time, you may see a couple little things here or there that you don’t see the first time. There are certain kinds of awareness and behaviors. It’s really like I’m playing two characters at once throughout the entire movie: One who knows nothing and one who knows everything. Atom was very sensitive to that. I loved working with him. And I loved working with Benjamin August’s script. I can’t say enough about those two fellows. Q: What are the advantages of age as an actor? What have you learned as you’ve gotten older? Have you changed? Landau: It allows me to see things a little differently than younger actors. I’ve never repeated a performance. I always think of something as new and unique and different: Where people come from, what schools they went to, if they went to college or what church they went to or what city they went to. That’s it. Those kinds of things are very important. One of the problems with writers today, I find, is that everyone sounds the same. What I’m saying, basically, is the actor today has to do more work than he used to because he has to delineate these things that I’m talking about. You ask me what’s changed in me? Point of view. Too many people are writing reviews and no nothing about drama and theater. They know nothing about (Henrik) Ibsen, Arthur Miller, Tennessee Williams or William Shakespeare, and they need to. Good writing needs to be talked about differently than stupid writing. Q: How do you feel about independent films versus studio films these days? Landau: It’s hard to find a character-driven movie today. You talk about your parents and your grandparents. What do they go to see? There’s nothing out there. Oscar time, yeah. Fox Searchlight will have a couple, and the Weinstein Company will have a few that they pick up from different festivals. But so many independent (films) fall through the cracks. They’re not seen by anybody. They’re not even on DVD. The only the ones that are seen are the possible ones that received nominations at awards time. It’s sort of sad. It’s a shame; I really mean it. Because the one good thing about this film is it registers in a lot of ways. It’s entertaining and a well-written script. How joyful that is. Half the time I read scripts and I don’t know how they got made. It’s as though they were written with a rake. Q: What are you working on next? What drives you to keep working? Landau: I just finished a movie (“The Last Poker Game”) with Paul Sorvino in Boston six weeks ago. We worked together. It’s directed by a Harvard professor (Howard Weiner), who is a neuroscientist and researcher who is probably—hopefully—finding cures for Parkinson’s, Alzheimer’s and MS. He has a laboratory and a private practice. He wrote the script and directed it. Paul and I had a great time. I also did a picture in Toronto recently and I’m going to do a movie with John Avildsen who directed the first “Rocky” and the first few three “Karate Kid” movies. The fact that I’m still perpendicular is what pushes me.